"Ms. Rabuck took us by the hand and explained everything to us about Estate Planning." "Dear Ms. Rabuck, Please accept my sincere appreciation of your involvement and efforts in this case. You have been most understanding, competent and patient as we pursued this matter over the last several months." "Your office has served me well. Ms. Anne J. Rabuck did an outstanding job of bringing my mixed estate to an orderly conclusion. She is to be complimented. Your staff treated me with respect and cordiality. It was my pleasure to deal with your office. I would recommend you to anyone"
"Bill and I have worked together in many capacities over the last 15 plus years. Everyone at Wilson & Wilson Estate Planning & Elder Law LLC provides excellent counsel and is willing to go the extra mile for me. My estate plan is up to date, well maintained and services are completed in a timely way. I know when I call I will receive a warm reception and someone will assist me. I also have a professional relationship with Wilson & Wilson Estate Planning & Elder Law LLC and know when I refer a client they will be assisted at the highest level and at a reasonable rate. I will continue to recommend my clients to anyone at the firm." "I have known Bill Wilson for years and referred the services of Wilson & Wilson Estate Planning & Elder Law LLC Law Offices to many of my clients. I know they will be met with compassion as well as excellent counsel which is important to families in stressful situations. Dealing with the families in crisis requires skills all of the staff at Wilson & Wilson Estate Planning & Elder Law LLC demonstrate every day." "We just received the refund from the facility today. Thank You so very much for all your help with my Mom's file. 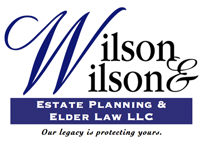 You and the staff at Wilson & Wilson Estate Planning & Elder Law LLC are outstanding people. It is an Honor to have your law office represent us. I would like to keep in touch with you for future family business.